A convict who had taken six people hostage at Greek prison has surrendered after a 24-hour standoff. Notoriously known for his two successful helicopter-aided prison escapes, the man was demanding his release in a third breakout attempt. Prison officials have announced that that Alket Rizai gave up on Sunday evening after realizing he was surrounded and there was no way he could break through special force’s cordons, local media reports. All of the remaining five hostages were released and are in good shape. One hostage reportedly escaped earlier on Sunday. However, it was unclear whether he was released by Rizaj, or managed to flee on his own. Police have also reportedly apprehended two other inmates who are believed to be Rizai’s accomplices. The 36-year-old Alket Rizaj, took four guards and two other inmates hostage late on Saturday night. The standoff continued into Sunday as police launched an operation using full riot gear and gas masks, according to local news agency NewsIT. "He is holding a knife and claims to have hand grenades and 200 grams of C4 explosive on him," a police official told Reuters. Rizaj threatened to detonate the explosives, killing himself along with the hostages if he was not freed. He was rumored to be under the influence of drugs. His lawyer implored him via telephone to put an immediate end to the situation, NewsIT said. Rizaj was asked to stop risking the "lives and physical integrity" of his hostages, and to protect his own life. Rizaj demanded a car to aid him in his escape, but did not impose a time restriction for its arrival. He was told that providing the car would take several hours. Two fellow prisoners were with Rizaj, the official said; it was ambiguous whether they were his accomplices or victims. Photographic evidence of the standoff originally emerged after a prisoner captured an image showing Rizaj standing beside his initial six handcuffed hostages, apparently holding one of the hand grenades, according to AP reports. Authorities said that the incident began at around 9:00pm local time after the lights went off in parts of the prison. As the standoff continues, authorities have deployed additional police to the scene and summoned the convict’s lawyer for negotiations. General Secretary of the Ministry of Justice Marinos Skandamis has also arrived at the scene to monitor developments. Police blockades have been set up in the region of Phocis in order to apprehend his suspected getaway car, a silver Opel. The 36-year-old Albanian was convicted of murder in 2003, and sentenced to life in prison. He is infamous for two successful escape attempts from Korydallos maximum security prison in Athens. In 2006, two accomplices landed a hijacked helicopter on the roof of Korydallos prison picking up two convicts, Alket Rizai and Vassilis Paleokostas, who was sentenced to a 25 years for kidnapping and bank robbery. They flew to a nearby cemetery and escaped on motorcycles. While Rizai was recaptured a few months later in September, Paleokostas remained at large for two years. His second escape in 2009 used similar tactics, the night before a court appearance over their first escape attampt. Rizai and Paleokostas climbed a rope ladder thrown to them by a passenger in the helicopter as it was flying over the prison courtyard. The men had been transferred back to Korydallos just one day before the attempt. While Rizai was recaptured again in November 2009, Paleokostas is still at large. 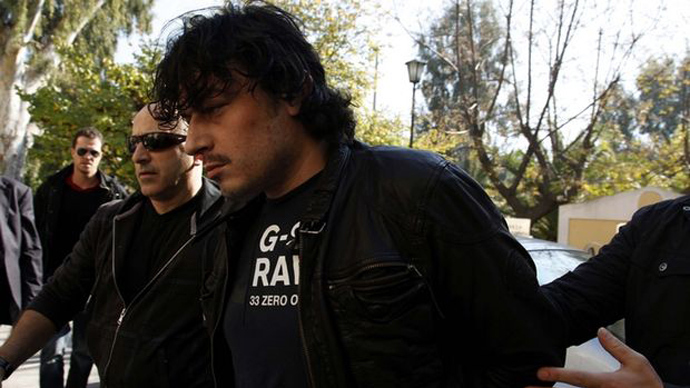 In 2011, Rizai virtually announced his third prison break attempt, saying in an interview with an Albanian newspaper that Greece is taking away his “best years” and that he would rather die than stop trying to escape.